Our Baseball Season has officially come to an end. I have to admit... I love being a Baseball mom. The energy and excitement at the games is awesome! Our little 6U team finished 3rd in our Regional State Tournament which was really cool and a lot of fun. GO TEAM!!! Anyway... to say THANKS to our head coach and base coaches, the team moms decided to go in on a special gift for each of them. One that they would never forget and personalized by each of the players on the team. 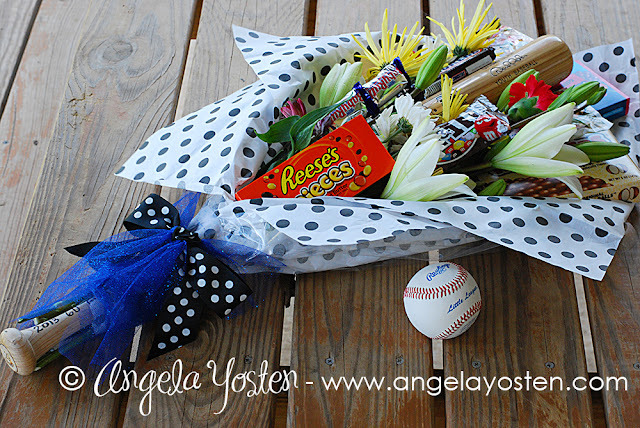 OUR HEAD BASEBALL COACH is a girl and she was great! So I put together this Baseball Bouquet for all the boys to present to her filled with flowers, a signed baseball bat from all the players and candy. 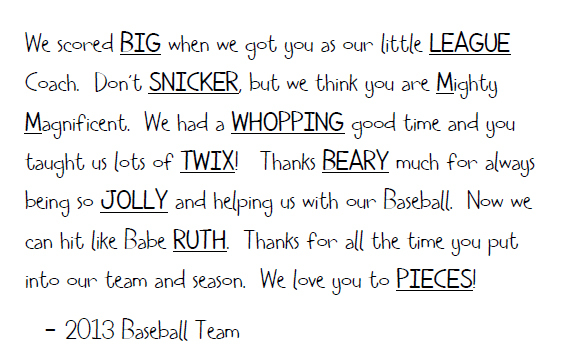 Candy - Big League Chew Gum, Snickers, M&Ms, Whoppers, Twix, Gummy Bears, Jolly Ranchers, Baby Ruth, Rieces Pieces. 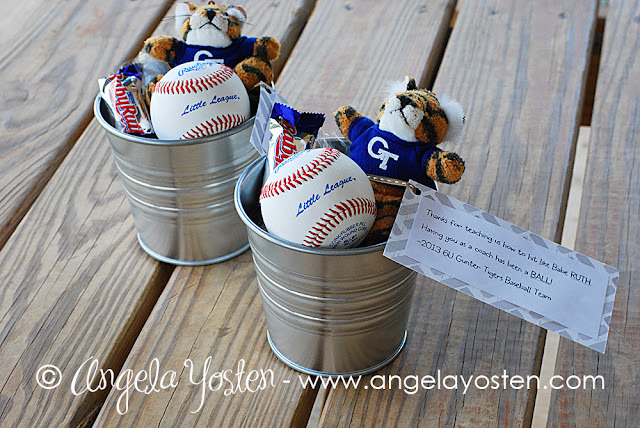 FOR OUR BASE COACHES I filled a galvanized bucket up with sunflower seeds and topped it with our mascot a Baby Ruth candy bar and a signed baseball from all the players. Thank You Card as shown above. Super easy and the coaches loved it! The boys had a lot of fun with it too. They all signed the bat and balls after presenting the gifts to their coaches. There may have even been a little bit of baseball chanting to cheer on their head coach for the great season they had. Great group of boys... ready for next season! Flats made it to the Magazines!